The 9th Annual Victorian Infrastructure Conference held recently covered a good range of topics, from the fundamentals of Infrastructure, upcoming construction and maintenance to ever amazing, HyperLoop1. Needless to say, the Government is taking this seriously. But where is the Victorian Government at in regards to creating a BIM Mandate for infrastructure in comparison to other states? And for the greater Building Industry, what are the knock-on effects if Infrastructure adopts BIM properly and Buildings is still behind? A draft BIM Mandate for Infrastructure has already been issued for public comment in QLD, Will the result of this mandate be, if you have BIM you’re in, if not, then you’re out? A2K has been talking to the legal teams that write the policies for BIM Mandates for some time, we are all watching intensely how QLD’s mandate unfolds. Only last month at MelBIM, a representative from the Victorian Government stated they are closely watching the development of BIM and working through policies and framework for implementation. The changes are getting closer; it’s now a decision for all involved in the Construction Industry as to whether BIM will be a Tsunami of damage or a floodgate of opportunity! 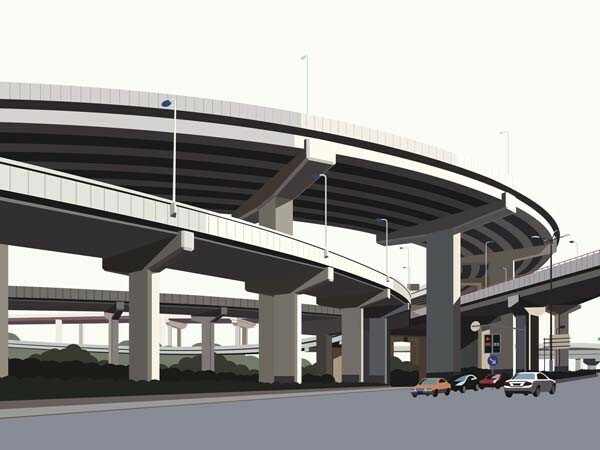 It is interesting comparing the output of Bridge design drawings to Building Structures. Is it that BIM for infrastructure is a natural fit knowing the higher degree of accuracy required Vs those of the building group tolerances? Buildings have managed to negate responsibility on the set-out, rebar placement and so on; Bridges have dimensions on their drawings. There is a higher standard in the detailing, and everything needs to physically fit, not something that the Shop Detailer will get to work! And is it that the structural component that needs to be managed after construction (FM) the reason why BIM works for infrastructure? There are many reasons as to why this makes sense. A2K have been training some major Australian and International Engineering Companies on how to model bridges in Revit for some time now. But, unlike so much of Building Engineering, they have taken to this task as a business decision throughout the company. That is to say from Senior Management, through HR, Middle Management and into the hands of the Operators themselves. BIM development plans have been created, HR is involved in training implementation and Managers have been educated and trained for the next shift in documentation. One of the next plays in this training for these companies is using the ‘natural data and output’ to help other internal processes. Checking levels, accuracy, quantities are just to name a few. Back of house needs to be in order! How can a team migrate from 2D lines to a Database driven CAD package without a clear understanding what it is that they are trying to create? For example, Project Drawings with tips and general information on how documentation should look, to exploded views explaining how a bridge is made and where the componentry for the Revit Objects can be found in their System. Also, the Project Browser is the key of Consistency. How many staff do you want to transition? Transitioning staff, is it all at once or in groups? How are engineers being shown this transition? What is the advantage for a PM and managers to understand this? Do you have established documented standards? Then, how do we get the best success for your company with the budgeted amount? What needs to be modelled vs detailed? The transition to BIM is not purchasing the software; it’s the Intellectual Property (IP) that a Company puts into it. If your Company sources all the IP entirely themselves and gleans the internet for as much as they can, there is no problem with that, just be aware that it takes time. Alternatively, if your Company would like to be trained and then guided by A2K Technologies, utilising our greater experiences that we have had nationally and overseas, either way, careful planning is required. Ultimately, this is a serious business decision, but a necessary one. Give it the time and diligence it deserves, so that it may serve your company well.